Pours clear dark amber with reddish hues, highly carbonated with a rich off white head. Not a whole lot on the nose, some sweet caramel malts and light hops. Not a bad winter warmer. The taste starts out with sweet caramel malts but it is quickly replaces with some hop bitterness, then effervescence from over the tongue. The back end has more caramel malts and a different hop bitterness on the finish. This is a pretty hoppy ale for a winter warmer. There is however some malt balance to it so it’s not one of those all hops IPAs. But the final aftertaste is a lingering hop bitterness. All and all this is not a bad beer. It’s a little too hoppy for my linking but it’s not bad. It is a very crisp clean beer with a fairly strong hop bitterness. The beer smoothes out a little more as it warms and opens up. The hop bitterness in this beer diminishes the winter warmer quality of this beer. I guess this will round out to a C+ or B-. 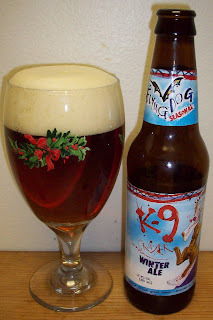 It’s a good beer but there are many other winter warmers that I like better then this one.